A kimchi refrigerator is a refrigerator designed specifically to meet the storage requirements of kimchi and facilitate different fermentation processes. Kimchi usually becomes too sour when stored in a conventional refrigerator for about a week. In contrast, kimchi can be stored up to 4 months without losing its qualities in a kimchi refrigerator. The kimchi refrigerator aims to be colder, with more consistent temperature, more humidity, and less moving air than a conventional refrigerator, providing the ideal environment for fermentation of kimchi. Some models may include features such as a UV Sterilizer. The prototype of kimchi refrigerators was created by Billtec in 1992. In December 1995, after three years of comprehensive work on development to best suit kimchi fermentation and storage, WiniaMando launched its first commercial brand, DIMCHAE (Hangul: 딤채), into the mass market. 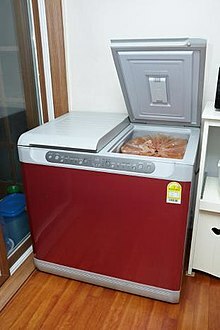 As of November 2007, more than a dozen home appliance manufacturers, including Samsung and LG, were involved in commercial production of kimchi refrigerators. Although the top-loading types were introduced first, this design took up much space and heavy plastic kimchi containers had to be lifted to get to the bottom part. The door-drawer types (the "stand-type" in Korea) are gaining popularity because of their space-saving ergonomic design. A single door with a wine-bar type design at the top can be opened in full or partially at the wine-bar section to save energy. The top portion can be used as a freezer. Two deep drawers make up the bottom portion to store anything from kimchi to wine, beer, etc. "How to select kimchi fridges" (PDF) (in Korean). Archived from the original (PDF) on 2010-12-14. "Kimchi refrigerator maintains taste of fermented food". The Korea Times. 2011-11-21. Retrieved 2013-03-23. 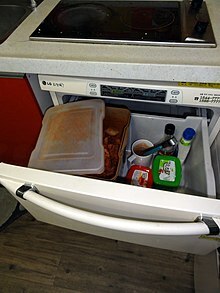 Wikimedia Commons has media related to Kimchi refrigerators.